Mintaro Historical Society was established in 1999 by Martin Smith, Derick & Corrine Bolton, Ron Gardner and the late Eric Jacka. The society was later certified as an incorporation in 2000. At this time, Martin Smith had just finished running the hotel, Magpie & Stump in Mintaro. With the change of pace, he noticed the local community was always changing and those with the history knowledge were fading. As a keen historian, Martin began to discuss with Derick, Corrine, Ron and Eric how to avoid the history disappearing along with the buildings of the town. The group began by researching into Mintaro’s fallen; the soldiers who signed up to fight for their country, went to war but unfortunately did not return. Initially the society was based in the Teapot Inn, displaying family artefacts, donated photos and memorabilia with volunteers on site to answer any queries. From this, the society and the history room has expanded to cover all aspects of the town and its people. A new building was built especially, situated on the land behind the Magpie & Stump pub to become the new, dedicated history room. Since the beginning of the society, many people have come to them seeking information about their past relatives. It is one of the most rewarding and successful parts of the society, to give answers to those with personal connections with the town. The society remains active and want to continue to improve and update the room and their knowledge. They are currently undertaking field trips to GPS, map and photograph how the town and the original dwellings of Mintaro farming area has been laid out in the past. 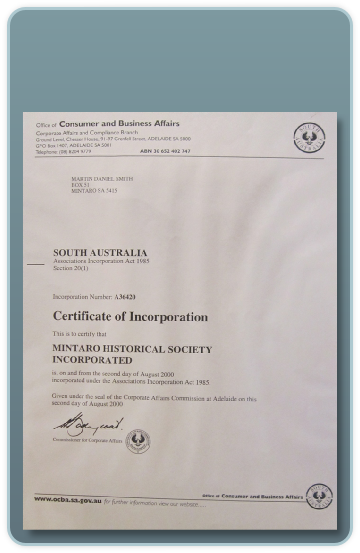 Mintaro Historical Society was officially certified on 2nd August 2000 as an incorporated body. The beautiful town of Mintaro, situated on the far eastern edge of Clare Valley, is considered one of the jewels of South Australia. This little state heritage town is rich with history and the Mintaro Historical Society Incorporated is dedicated to capture and savour it.